Brown turkey in a large skillet on medium heat. 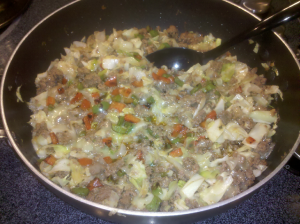 Add onion, peppers and garlic and cook until onion is soft. Stir in sauce and spices and cook covered for 5 minutes. Add the cabbage until cooked to desired softness. Top with cheese and serve. « Hungry or just thirsty? I will give this one a try tomorrow,thanks!